These incentives are a great way to get started on a greener, easier commute, whether you’re taking public transit, carpooling, or biking to work. A free “insurance policy” against being stuck without a way to get home. Sign up today! Pledge to try transit as an alternative to driving alone to work or campus & receive a pre-loaded $15 clipper card. Qualifying applicants could receive $25 to carpool, take transit, bike, or walk to work. Get started today and vanpool your way to $1,000 in bonus cash! Buy one get one free offer for the popular WestCAT Lynx 31-Day Transbay Pass. Commuter 20-Ride Pass: Buy 1, get 1 free – valid on all routes including Express Route 300. BOGO offer for 31-day passes on Route 80 (I-80) and the Yellow Line (I-680). BOGO offer for a 31-day pass for SolanoExpress Green Express Line or Blue Line. 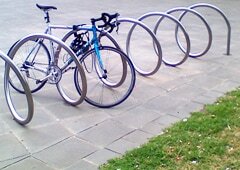 Request to install a free bike locker or bike rack at your workplace.